Ori Hofmekler developed The Anti-Estrogenic Diet for women and some men with signs of estrogen imbalances. In men it may show up as prostate disorders and a reduced sperm count. Inability to lose stubborn abdominal fat. A reduction in the ability to tolerate stress. Hofmekler explains that estrogenic chemicals may be found in the diet in foods such as meat, beer, fruit and vegetables treated with pesticides, soy foods, and artificial sweeteners. Synthetic forms of estrogen called xenoestrogens are also found in cosmetics, cleaning products, air and water. The Anti Estrogenic Diet is based on eliminating estrogenic foods and chemicals while adding anti-estrogenic foods, herbs and spices. Hofmekler also states that our bodies are designed to digest foods when we are at rest rather than at more stressful and active times of the day. He advises dieters to eat lightly during the day and to eat their largest meals in the evening. 1. The first phase is a liver detoxification program that emphasizes fresh fruits and vegetables (especially cruciferous vegetables such as broccoli), low-fat yogurt, organic eggs, beans, whole grains, wild-caught fish and aged cheese. 2. In the second phase dieters introduce foods that have a specific anti-estrogenic effect. Olives and raw nuts and seeds are added to the phase one diet and this higher fat diet provides nourishment to the hormonal systems of the body. 3. The third phase allows meat, bread and pasta to be reintroduced into the diet in the evening meal only. Every other day dieters are advised to adopt either a phase one or two dietary approach. Specific foods that have an anti-estrogenic effect include cruciferous vegetables (broccoli, cauliflower, cabbage and Brussels sprouts), citrus fruits, organic milk products, nuts, avocados, eggs, coffee and tea. Organic foods are to be selected whenever possible Hofmekler also advises the use of supplements to increase the effectiveness of the program by inhibiting estrogen and enhancing liver detoxification. Many other healthy recipes can be found here. 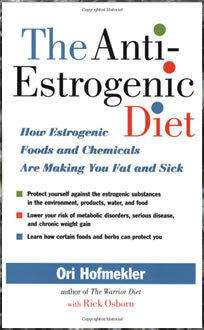 The Anti Estrogenic Diet costs $16.95. There are also supplements recommended that will add to the cost of following this diet. Speaks to those who have tried a variety of other approaches without the desired results and who are suffering from the signs and symptoms identified as related to estrogen imbalance. Does not eliminate entire food groups but rather recommends switching lower quality foods for higher quality. For example choosing organic yogurt and aged cheeses over commercial dairy products. Reduces exposure to pesticides and chemicals in the diet and environment. May reduce risk of developing hormone related conditions such as polycystic ovarian syndrome, breast, ovarian, cervical and prostate cancer. May also assist with the management and reduce the risk of a number of other conditions such as insulin resistance, diabetes, chronic fatigue syndrome and fibromyalgia. Some dieters may have difficulty adjusting to having only grapefruit and coffee for breakfast and the other lighter meals allowed during the day. Recommended supplements will increase the expense of following this diet plan. There are likely to be other factors involved in the success of this diet in addition to its effects on estrogen balance. The advice to eat lightly within the boundaries of a limited range of foods will make decisions on what to eat during the day easier and thus calories will be easily restricted. Nonetheless this is a highly nutritious approach to dieting that will provide quality nourishment while also reducing appetite and is especially recommended for dieters who display signs of estrogen imbalance but have failed to achieve the desired results on other weight loss plans. Dairy contains high amounts of estrogen as it is produced by pregnant cows and is probably the worst thing you could eat. There are much better, safer sources of vitamin D and calcium. I was diagnosed two years ago with breast cancer and refused the traditional treatments of chemo and radiation. I feel great! This diet recommends coffee and tea, but from what I have read elsewhere coffee is one of the worst foods for estrogen dominance. Even organic coffee so I am very confused. Can anyone tell me if we should be avoiding vegetables other than the cruciferous? I know a lot of vegetables have estrogen but are they(pears, apples, etc.) as harmful as the estrogen from meat? I also thought eggs and milk of any sort would be high in estrogen and was surprised to hear that organic milk and eggs is o.k. I’m confused. I eat a ton of vegetables, beans and rice. I read that beans are high in estrogen. I read so much conflicting information. I’m really not sure what I should be eating. I must eat a low estrogen diet. Any factual information you can share with me is very much appreciated. I called and talked to a dietician at a hospital who said “eat your vegetables as we are beginning to think the plant estrogen may effect the body in a positive way”. HELP! i have a hormonal imbalance which the doctor says that i may have polycystic ovary syndrome or maybe just a hormonal imbalance.. i have a very heavy menstrual period which sometimes last for months and sometimes i dont have my period..also i am gaining weight in which i think and according to research is part of having hormonal imbalance..my doctor prescribed a pills, it then turn out to be okay during my therapy,then after my therapy,after how many months it goes back again to the same problem..i am overweight right now in my height and age.can you pls give me some diet plans and advise to help me reduce my weight to normal and to correct my hormonal imbalance..thank you! Ori Hofmekler suggests 1-2 “fertile eggs” with one yolk per day not just an organic egg. Use of organic eggs if fertile eggs are unavailable. did i mention that the 20th january 2010 will be my 10th year as a survivor on the anti estrogenic diet plus a regular exercise program. just sharing with you the blessing. i believe in the anti estrogenic diet. i was diagnosed with an invasive lobular and ductal breast carcinoma, ER+ in one tumor and ER- on the other. most of my co-patients’ br ca had returned and a lot of them had died within 5 years. they were on their old diet before cancer. i may have been a laaughing stock of those patients but on 20th january 2010, i will celebrate my survivorship and my anti estrogenic diet.